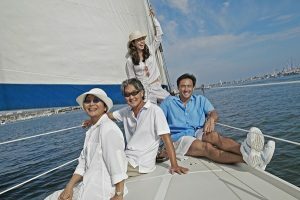 Let the waters of Cape Cod be a venue for your summer family reunion, and have some fun while sailing with your family! Your family reunion is the perfect occasion to spend quality time with your family. Why not take your family out on the water? Let the waters of Cape Cod be a venue for your summer family reunion, and have some fun while sailing with your family! Create a lasting memory for everyone in your family aboard The Liberté and make the most of a summer day with music, food, and fun with for people of all ages in your family. As you plan your next family reunion, consider the many reasons to plan your next family reunion with a Cape Cod day sail aboard The Liberté! No matter how big your family is, The Liberté can comfortably accommodate everyone in an exciting atmosphere. The Liberté holds 49 people so that you can relax, have fun, and enjoy the day on the water with your family. The scenic views of Cape Cod are also a great backdrop for photos, allowing you to capture the fun and exciting memories with your family during your reunion. Family reunions are great for enjoying great food and drinks together! On The Liberté, you are always welcome to bring your favorite foods on board for your sail. Enjoy a potluck style family reunion with all of your favorite foods! Additionally, The Liberté also offers a fully stocked bar with both alcoholic beverages and soft drinks to comfortably accommodate your entire family during your sail. We love having families aboard The Liberté! Have fun on a family-friendly sail around Cape Cod as your kids enjoy this memorable experience on the water. On The Liberté, kids of all ages can safely explore and enjoy a day of fun on the waters of Cape Cod. With this, families can relax, enjoy music and great food, all while taking full advantage of all that The Liberté has to offer while also knowing that their kids are safe on board. On our Cape Cod sails, your family also will have opportunities to learn more about the water and the town, with sails along beautiful historic sites throughout the day. Enjoy Your Beautiful Summer Sail in Cape Cod Aboard The Liberté! This entry was posted on Thursday, July 19th, 2018 at 2:34 pm. Both comments and pings are currently closed.